We love our crockpot. It makes cooking with Bug so much easier. We throw something in there the morning of or the night before and we don't have to worry about if Bug will be sleeping when we need to prepare dinner at 5 PM. This recipe was really, really easy, and it tasted good, too. It has earned a spot in our kitchen binder, that's how much we liked it. Plop chicken breasts at bottom of 3 quart crockpot. In a small bowl, mix chili powder and lime juice. Slowly pour about half over the chicken breasts. Flip the breasts and pour the rest on the other side. Shred the chicken and add salsa and corn. Stir and cook for another 45 minutes. Set the crockpot to off and stir in the cheese. 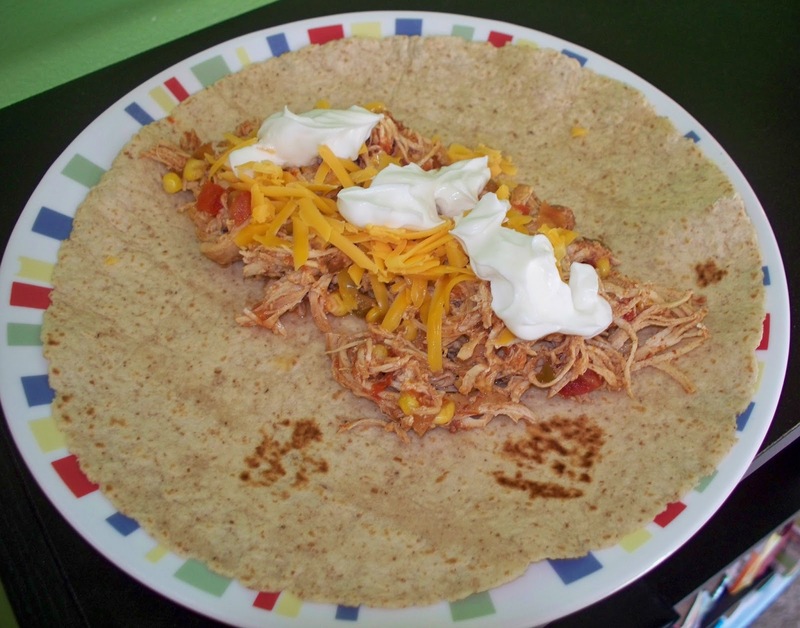 Grab a tortilla and plop some chicken mixture on it. Top with sour cream.